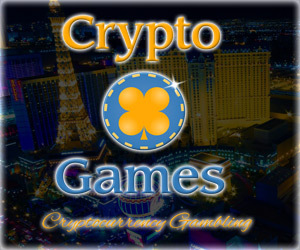 Similar to any other web faucet service for a different crypto currencies, an Ethereum faucet is a website that offer its visitors absolutely free a small amount of Ethereum (ETH) Ether coins. What you have to do in order to get some free ETH coins is to just enter your Ethereum wallet address and a complete a simple captcha (to prevent bots) and then you will get for free a fraction of a single ETH coin in return. 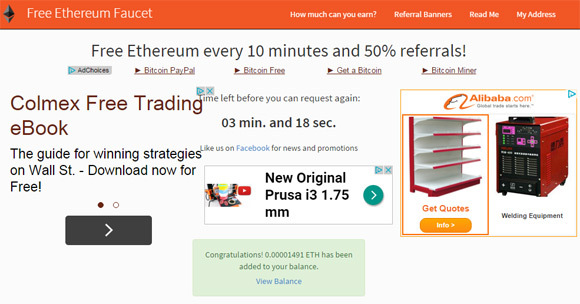 The Free ETH Faucet is a new faucet service that awards visitors with an amount of Ethereum coins somewhere in between 0.00000764 and 0.05096113 ETH on each claim you do, depending on your luck and you can request again and again from the faucet in just 10 minutes. To get paid from the ETH faucet you have to accumulate at least 0.0008 ETHER in your balance and then the coins can be sent from the BoxETHER service to your Ethereum wallet address if you request them manually. 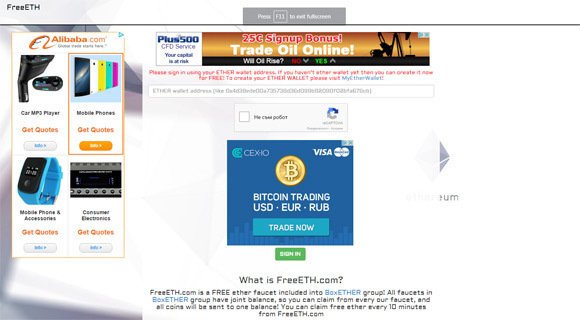 With the recent jump in interest and price of the Ethereum Ether (ETH) coins the Free ETH Faucet is a great place to earn some extra coins without too much effort and time spent doing it. Furthermore you can take advantage from an additional 100% bonus for inviting your friends to start using the ETH faucet, the additional referral bonus is extra for you every time they claim from the service while your friends will still get their full Ethereum reward, so spread the word. An Ethereum (ETH) faucet is a website that offer its users completely free small amounts of Ether coins, just like a faucet for Bitcoin, Litecoin or any other crypto currency, though here you will get Ether coins. All you have to do to get some free ETH coins is to enter your Ethereum wallet address and a complete a simple captcha (to prevent bots) and you will get free ETH coins in return. 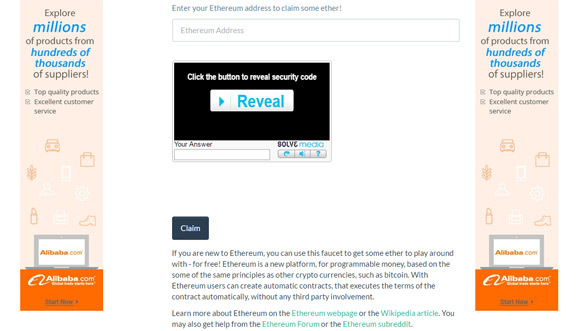 The Free Ether Faucet is a new faucet service that awards visitors with 0.00020000 ETH on each claim and you can make a new claim every 15 minutes. 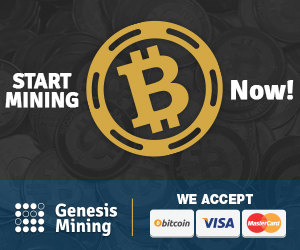 Furthermore you can decide to cashout at any time as long as you have managed to earn more than the minimum network transaction fee that is being deducted when withdrawing coins. So get started claiming your share of free Ethereum coins from the Free Ether Faucet now as with the recent jump in interest and price of the Ethereum Ether (ETH) coins the faucet is a great place to earn some extra coins without too much effort and time spent doing it. There is also an additional 50% bonus you can take advantage from for inviting your friends to start using the ETH faucet, the additional referral bonus is extra for you every time they claim from the service while your friends will still get their full Ethereum reward, so spread the word. Just like a faucet for any other crypto currency an Ethereum faucet is a website that offer its users completely free small amounts of Ether coins. All you have to do to get some free ETH coins is to enter your Ethereum wallet address and a complete a simple captcha (to prevent bots) and you will get free ETH coins in return. The ETH Faucet is a new faucet service that awards visitors with an amount of Ethereum Ether coins between 0.00000497 and 0.0281799 ETH on each claim, depending on your luck and you can request again and again from the faucet in just 10 minutes. To get paid from the ETH faucet you have to accumulate at least 0.1 ETH in your balance and then the coins can be sent to your Ethereum wallet address if you request them. With the recent jump in interest and price of the Ethereum Ether (ETH) coins the ETH Faucet is a great place to earn some extra coins without too much effort and time spent doing it. You can take advantage from an additional 50% bonus for inviting your friends to start using the ETH faucet, the additional referral bonus is extra for you every time they claim from the service while your friends will still get their full Ethereum reward, so spread the word.